My time at the ISM was an alchemical moment in time when the elements of ideas, people, and place came together to produce a remarkable and magical experience. Happily, this alchemy transformed my life as well. Upon graduating from the ISM and YDS in 1993, I returned to Paros, Greece to teach watercolor painting and figure drawing, as I had done during the summer during my two years at Yale. Coincidentally, a Yale Divinity School professor, Victoria Sirota, and her husband, the composer Robert Sirota, were on Paros at the same time. Our enduring friendship was forged there, through times of prayer with Vicki in the 4th century Byzantine cathedral, and a watercolor lesson with Bob. Later that fall, I returned to the ISM as an artist-in-residence, and for the first time in my life set out to communicate on canvas my experience as a Christian. The first images I depicted were based on the symbol of the draped cross on Good Friday, which had had a profound impact on me as a child. These paintings ultimately led to eight Stations of the Cross, which were displayed in Marquand Chapel under Vicki’s guidance as the chapel director. The experience prompted me to ask Bob if he would be interested in doing a painting and music collaboration based on the Stations. He agreed and we planned to do it in New York, where he was Dean of Music at NYU. It seemed that God had other plans, however, when Bob was named Director of the Peabody Institute, and I found myself back in my hometown of Baltimore, Maryland. Three years later, in 1997, Bob and I completed The Passion of Jesus Christ: A Visual Oratorio. The work is comprised of eight large oil paintings depicting a complex and highly symbolic interpretation of the “Body of Christ” (as my time at the ISM focused on symbolism and iconography). In response to the paintings, Bob composed an eight-movement piece for organ, piano, three solo voices, a twenty-voice choir, and percussion. At the premiere in Baltimore, Bob conducted, Vicki was at the organ, and Samuel Springer (M.M. ’95) played the piano. The piece was performed in several venues in the Baltimore-Washington area, and plans are in the works for another Baltimore performance in spring 2015. 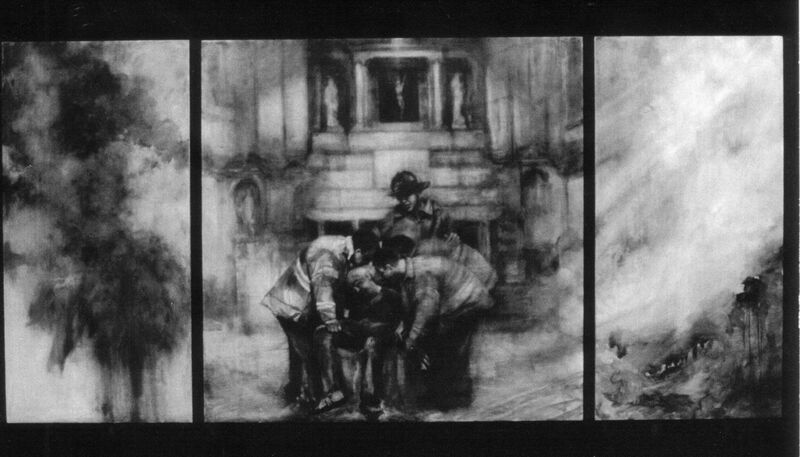 In 2002, Bob and I collaborated again on Triptych, a commemoration to the victims of 9/11. Written for string quartet, it is a three-movement, three-painting work that was premiered by the Chiara String Quartet at Trinity Church, Wall Street in September 2002 and has since been performed in venues throughout the world. Concurrent with my artwork, I became deeply involved in the small mission church where Vicki was vicar. Located in a very challenging and underserved area of Baltimore, the needs of the church were great, particularly those of the children. For years I taught art in the church’s afterschool program, while Vicki dreamed of building an arts and community center for the surrounding neighborhood. Her dream was realized with the completion of the center in 2006. The following year, I received an Open Society Institute Community Fellowship to implement an arts program in Baltimore. From this experience I learned the importance of a holistic approach to community art, one that includes and engages not only the children, but the adults and stakeholders too. To this end, I sought training in an inclusive, grassroots, bottom-up process called placemaking and subsequently founded the nonprofit ARTblocks, which works with Baltimore communities to transform their neighborhood spaces through placemaking and their own creative ideas. In order for ARTblocks to be an integral part of the Baltimore community, it is based in a storefront in Hampden, a centrally located funky arts neighborhood, where I also live, make art, and sell my artwork. My interdisciplinary studies in theological aesthetics, sacred space, church history, and more at the ISM and YDS have influenced and informed everything I have done ever since. And the journey continues. For nearly twenty years, Samuel Springer and I have shared our own ISM-like colloquium with ongoing conversations about the intersection of art and music. We hope someday to collaborate on a project. I also long to return to two projects I began at ISM: the publication of my degree project on the Gordian knot in Christian art, and an oil portrait of Professor Peter Hawkins.